Recently, Mark Alpert posted a blog about The Writing Buddy and how writing can be a lonely occupation. There are few methods of getting around that situation. If you want to write fiction, it’s usually a one-man show. Fortunately for me, I have a solution—a cowriter. One of the most frequently asked questions Lynn Sholes and I get is “How is it possible for two people to write fiction together?” The answer is, it ain’t easy. At least it wasn’t at first. Collaboration on non-fiction is somewhat easier to understand. In general, with non-fiction, the “facts” usually already exist and the collaborators’ job is to organize them into a readable document that has a beginning, middle and end. A good outline and knowledge of the subject matter along with professional writing skills may be all the authors need. But with fiction, nothing exists. It’s all smoke and mirrors. Fiction is a product of an individual’s imagination. It might be inspired by actual facts or events, but only the individual has a specific vision of those events in their head. So how can two people have a similar enough vision to be able to write a novel together? I can’t speak for the handful of other writing teams out there (including TKZ’s own PJ Parrish), but Lynn and I have managed to complete 6 thrillers together because of a number of reasons. First, we love the same kind of books—the ones we read are like the ones we write. Second, we have an unquestioning respect for each other’s writing skills and a deep belief that whatever one of us writes, the other can improve. Third, we believe that there’s always a better way to write something. Fourth, we never let our egos get in the way of a good story. This comes from spending over 10 years in a weekly writers critique group. Fifth, we know each other’s strengths and weaknesses, and are willing to admit them. Sixth, we agree on the same message/theme in each book. Seventh, we believe that we are on the same level of expertise. And last, we believe that the whole is greater than the sum of the parts. Those points cover the mental portion. Now, how do we handle the mechanics of the job? We talk, and talk, and talk. Once a day we conference call, brainstorm, tell and retell each other the story. Our two favorite words are: What if? Whether it’s global plot points or an individual scene or character motivation, we keep telling each other the story until that little imaginary movie in our minds becomes as in-sync as possible. Then one of us will declare they have a “handle” on the scene or character or chapter, enough of which to create the first draft. We write very slowly because each chapter must go back and forth many times for revision. Years ago, when we first started, everyone could tell who wrote what as we tried to write our first book. It took three years of hard work before we melted our voices together. Now, because the process goes through so many revisions, even I can’t always remember what I wrote and what she wrote. I rely on my co-writer so much that I’ve come to wonder how individuals can possibly write a book on their own. There are a number of advantages and disadvantages to collaborating. A disadvantage is that you split any money you make. So you’ll always make half of what you could as a single author. And like any relationship, there is always a chance of a falling out. And something could happen where an ego can become inflated and affect the process. One of the pluses is that we never experience writer’s block. One of us will always have an idea on how to get out of a jam or move the story forward. And unlike our spouses, family, friends, trusted beta readers, and everyone else, a co-writer has an intimate, vested interest in the success of the story that no one else could have. Lynn and I are approaching the mid-point of our seventh thriller together (THE SHIELD, the follow-up to THE BLADE). I’ve found that creating the first draft of a chapter is just as exciting as getting a new chapter from her and seeing where the story has gone. I guess the whole thing boils down to trust. Trust in each other and in the goals we both want to achieve with the story and with our careers. One last note: I haven’t seen Lynn in person in over 5 years since we live hundreds of miles apart. That seems to be something that mystifies everyone. So, now that you know how we write together, do you think you could ever collaborate on a novel? Or is writing fiction too private an experience. 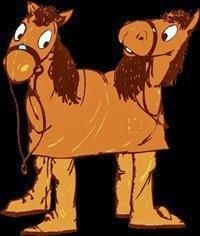 Do you believe two heads are better than one or would you rather not have anyone sticking their nose in your work? This entry was posted in collaboration, Joe Moore, Lynn Sholes, writing process, writing suspense, writing techniques, writing the thriller, writing tip, writing tips by Joe Moore. Bookmark the permalink. Glad to see this post! Years ago, I did some collaborative writing with a like-minded critique partner. Though the works were never published, I loved the process. The whole was definitely greater than the sum of the parts. We both continued to write and eventually published individually, but we still talk about the fun and enhanced productivity/creativity we had with the collaborative process. I’m sure it’s not for everyone or even for every story. We had very similar personalities and had been critiquing for a while. The like-minded part was crucial. And I’d love to see a another post on the technical/business side of this topic: i.e., time management (do you set deadlines/time limits?) Do you co-plot stories before writing? How to handle copyright? Legal agreements? Accounting/payment? Good question re the business side of collaboration. If you consider it — even with a relative — you need to work out details ahead of time. I strongly recommend a partnership agreement wherein you spell out what happens to the properties (books) if you split up, who gets use of the pen name, how the royalties are split. Lots of things to think about. You also need a legal will which spells out beneficiaries if one of you dies. (Sorry, but it’s a reality for your heirs). A good agent will help you with this but many of us don’t have agents these days so you have to do it yourself. You also have tax considerations. There are many ways to handle this. Again, an agent will just split any monies and send you each year-end tax stuff. But if you are doing this alone, you MUST work this out. Amazon allows only one name per account, for instance. So in my case, I handle all our Amazon income and send Kelly a check. But at year’s end, I have to send her a 1099 income form. As I said, lots of things to consider! You also have to be very diligent about recording expenses and deciding who takes what deductions on taxes. Like: I pay for our website and have to bill Kelly for her share and we have to keep careful records for taxes. It can get hairy. Cate, Kris has covered most all the ins and outs of the biz-side of collaboration. Fortunately for Lynn and I, we both have been using the same CPA for years, so we just keep our individual records, send them to him and do whatever he says. Thanks, PJ and Joe! I hadn’t even thought about things like taxes/expenses. None of legal/technical issues are insurmountable, but they do have to be covered up-front. And I’m still voting for a future post on this topic. With a handy-dandy checklist of considerations, perhaps? 🙂 Again, thanks! Tons of great detail here. Wow. Lots to consider. I really dislike the business side, especially if I have to get involved in cutting checks and maintaining a dual accounting on expenses. Thanks for asking the question, Cate, and for all the great responses. I certainly think about it, Joe. I think it could be fun. I’ve worked a lot with project teams (in person and over the net). I would think this collaboration would be quite difference, especially in the “fiction” area. Of course a goodly amount of fiction exists out there in the weel-world. It’s great that the two of you can treat this as a business. That’s essential. Of course, we’ve all heard about how various Hollywood collaborations (where a thousand VPs and hangers-on jump in) can go terribly wacky and destroy a good story. I am very susceptible to the least suggestion and can go running with any tangent. That probably would work well in a collaboration. However, I am trying to get an old friend to move to Missoula and he’s more like me than I am. (Basil, jump in any time here.) We could write about our past adventures and all the nutty people we’ve know. That would be a start. So, Joe, I’m interested to know how the two of you just happened to make that turn in the road all those years ago. How did the spark ignite? Jim, as I mentioned, Lynn and I were part of a local critique group for over 10 years. One meeting, she mentioned an idea she was playing with. I thought it was a terrific concept. She never did anything with it, so a year later, I threatened her that if she didn’t writer the book, I would steal the idea and write it myself. We compromised and decided to do it together. It took us 3 years to write THE GRAIL CONSPIRACY. It went on to become an international bestseller and has been translated into 24 languages. We’re now working on our seventh novel together. Now that’s a nice, happy story right there. And it really shows that there are all sorts of gems out there, and that if one just gets “out there” and participates, all sorts of good things will likely happen. You never know from where IT will come. I admire how you and Lynn turn out such fast-paced thrillers, Joe. PJ Parrish is another collaboration that works. But it’s just too hard for me to work with another writer, no matter how good that person is. Elaine, collaboration on fiction is definitely not for the weak of heart. But judging from your great success for so long, the last thing you need is a co-writer. I think it would be great to work with a co-writer but for me I’d have to set pretty specific parameters and being a bit of a control freak when it comes to my writing I would have to totally check my ego in at the door. I’d also have to grow a thicker hide – but being an author these days requires that anyway! Clare: Yeah, you can’t let the ego take over or you’re doomed in a collaboration. Kelly and I often refer to having a third collaborator — the story. It always wins. Love this–we have an unquestioning respect for each other’s writing skills and a deep belief that whatever one of us writes, the other can improve. No egos. It’s definitely one of the most important tips, Patricia. Egos and guns must be left at the door. Joe– I take what you say at face value. After all, you and your partner have the books to prove it. But like the chimerical notion of a 50-50 marriage, the idea of perfect balance in your collaboration is hard to grasp. If however you tell me that you defer to your partner in certain areas where she shines, and she does the same with you–that I get. That’s how we do it, Barry. It works for us, but I can’t speak for any other writers. Thanks for dropping by. I don’t have a writing partner, but my son is my brainstorming partner. I talk through my plot problems and he always offers great suggestions. He is a great listener and really understands my vision. Then he makes it even better. All the best parts of my book are from him. Faith, you son is a valuable asset. Honest feedback is so important. Joe, having had the privilege of editing your and Lynn’s latest book, The Blade, I can certainly attest to the fact that whatever your methods, they’re working beautifully! I was afraid it was going to get way too complicated, but it wasn’t at all! And I loved the results! Not to mention, I got to meet two great people! Met Lynn in person at Killer Nashville and am looking forward to meeting you at some writers’ conference somewhere! Thanks, Jodie. We have another one coming your way in a few months. Very enlightening, Joe. Not for the faint of heart.